Superstar Mahesh Babu’s Brahmotsavam which is releasing worldwide this Friday is literally painting the town red. There is a festive atmosphere across the theaters in both the two Telugu states. The decorations at the theater give us a true Telugu festival vibe of Sankranthi in this hot summer of May. Brahmotsavam is coming in with the infallible combination of Mahesh Babu and Srikanth Addala who previously delivered the classic Seethamma Vakitlo Sirimalle Chettu. PVP Cinema which reunites this combination has put its best foot forward for publicity. It is like nothing we have seen before in recent past. Brahmotsavam hoardings and posters and vinyl’s etc can be seen everywhere which has made it the talk of the town. With positive censor reports Superstar Mahesh Babu is all set to deliver yet another blockbuster after Srimanthudu and give PVP Cinema a hat-trick after Kshanam and Oopiri. 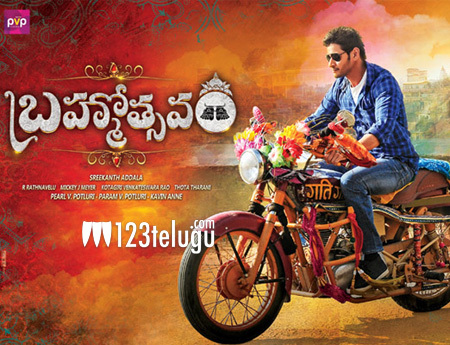 Brahmotsavam begins for fans and audience from May 20.